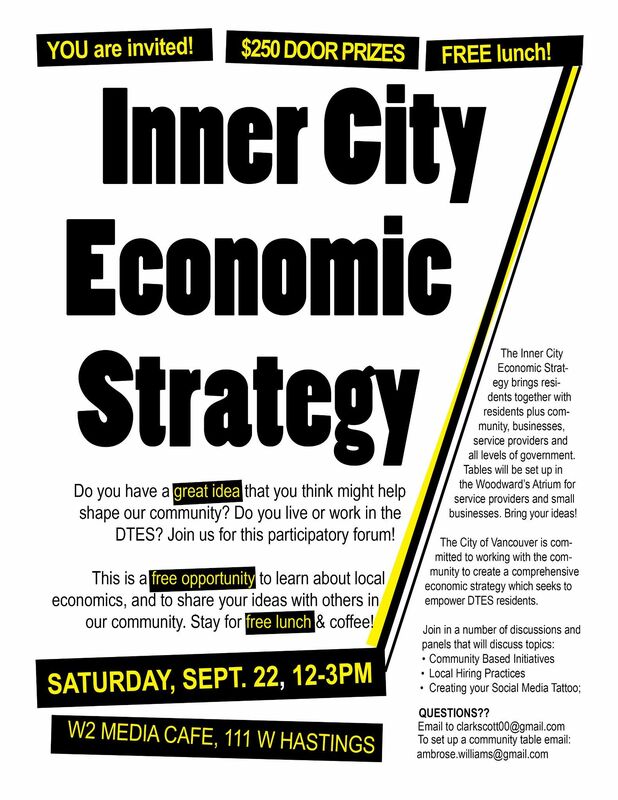 The Inner City Economic Strategy seeks to bring together the residents of the community, with other residents, businesses, service providers and all levels government.The City of Vancouver is committed to working with the community to create a comprehensive economic strategy which seeks to empower the residents of the Downtown Eastside. Unique populations have to be considered, women, Aboriginal, youth, immigrant and the aging population. This event is open to everybody who wants to contribute to taking ownership over this strategy. Display tables showcasing efforts for inclusive economic development will be featured in the Woodward’s Atrium including ALIVE, ICNC, W2, RayCam, and others. We welcome others to this inclusive event! See you at 12 noon on Saturday!